AS the primary market slows, multidisciplinary company Veritas Design Group sees opportunities in owner-investor projects such as hotels, resorts and office buildings, as well as infrastructure projects. 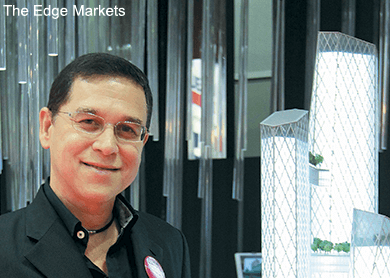 Real estate developers are undertaking more of these projects as a countercyclical move, says Veritas CEO David Mizan Hashim. “Compared with a few years ago, we have more projects in the non-speculative market. I think [it is because of] a number of things that happened recently. It’s bad luck that they are coming together at the time. One is the recent decline on the stock market. Although it’s back up again, it’s lingering in people’s minds. Of course, the drop in oil and gas prices has people concerned about the economy and it’s tied to the stock market. Then, the Goods and Services Tax [was implemented], combined with a bit of an overhang,” says David. Speculative projects, in design parlance, refer to those built by developers for the primary market. “Developers have jumped on the bandwagon to build small high-end — over RM1,000 psf — units over the last three years. There are a lot of them out there. So, that could be one area that is overbuilt,” says David. According to data from the National Property Information Centre, there were 2,449 overhang units of condominiums, apartments and serviced apartments in 2014. The high-rise segment comprised 20.7% of the country’s total overhang. “It’s obvious that certain projects have slowed down. If the projects haven’t advanced far, they are not going to move as fast as the developers had originally thought. However, there are exceptions — there are crazy developers who are going to launch anyway, and good luck [to them]. However, if we create something really unique, people will buy,” David says. That being said, some of Veritas’ most exciting projects are a mix of both. Among its biggest projects this year is the RM3 billion integrated development by Singaporean developer Oxley Holdings Ltd coming up in the heart of Kuala Lumpur. Oxley Towers, Oxley’s flagship development, will be built on a 3.4-acre freehold site in Jalan Ampang currently occupied by a Nasi Kandar Pelita outlet. The deal made headlines due to the record price of RM3,300 psf Oxley had paid to vendor Loke Wan Yat Realty Sdn Bhd. The project comprises three towers of 28, 49 and 79 storeys that will include hotels, serviced apartments and offices. There will be 600 units of branded residences and 220 hotel rooms in the 79-storey building that will be managed by Sofitel. The 265 units of branded residences and 190 hotel rooms in the 49-storey building will be managed by Dubai-based international hotel chain Jumeirah. The project has been approved by Kuala Lumpur City Hall for a plot ratio of 14. Oxley, in typical Singaporean developer style, then held a design competition among six architectural firms from Malaysia and its home country, says David. “So, sometimes being vague allows you to be creative. We came up with a solution which I thought was crazy at first. “Oxley loved the idea. The site was big enough for two or three towers. Many of the competitors designed two towers while we went for three. I think they liked it because it gave them more flexibility on when to launch what and how to brand the buildings. It would also be easier to sell en bloc. It gave them three ways to play the game. The four-star Sofitel and six-star Jumeirah residences and hotels are designed with separate entrances. Furthermore, the Sofitel residences will be above the hotel while the Jumeirah residences will be built below its hotel. “It’s done this way so that the two brands do not compete with each other. They have different entrances and it makes it more interesting and creates a bit of mix and competition,” says David. There will also be three bridges — at the podium, the mid-level and near the top. They will be used as food and beverage spaces. “Have you been to Marini’s on 57 at KLCC? It really generates money. So, these spaces are very valuable. They cost a bit more to build, but they are really profitable,” says David. One of Veritas’ longest-running projects to date is Star Residences in Jalan Yap Kwan Seng, KL. The project comprises a 57-storey tower and two 58-storey towers of serviced apartments with a total 1,521 units. The project is part of Star Development, which also comprises five units of 6-storey retail lots called Star Boulevard. The 4.2-acre project has a gross development value of RM2.2 billion. Veritas was awarded the job in 2002 by Alpine Return Sdn Bhd, a joint venture between Bolton Bhd (now known as Symphony Life Bhd) and United Malayan Land Bhd. However, over the years, the project saw many changes in its stakeholders — Singapore’s CapitaLand Ltd once held a stake in Alpine Return and Symphony Life executive chairman Tan Sri Azman Yahya has emerged as a major shareholder in the company — and each of them insisted on reviewing the project due to market changes and design preferences, says David. In addition to reviewing the designs, the new stakeholders also held international design competitions. “We have been through four of these [competitions]. There were at least 30 different designs for this site!” says David. Over the years, the plot ratio for the site has risen to 12 from eight in 2002, which enables the developer to have three towers instead of two. Star Residences is also one of the more ambitious projects on the primary market. The developer is confident that it will do well despite the slowdown, says David. “To show you how confident they are: they were advised to build a tower at a time, but they said no, and awarded the construction of all three towers to Samsung C&T Corp,” he adds. The first tower, comprising 557 serviced apartments, has been 80% sold since its launch in January last year. The next tower will be unveiled in 3Q2015. 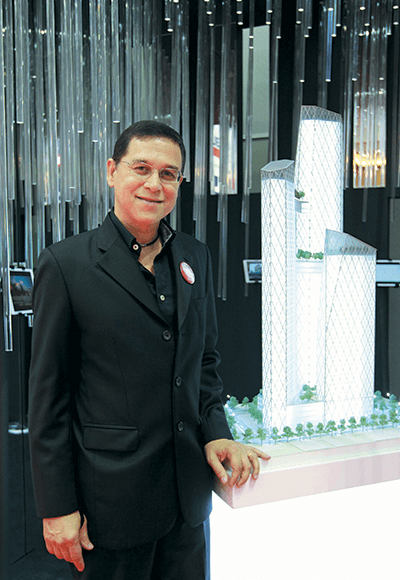 The units of the first tower were sold for RM1,600 psf on average. The indicative prices of the units of the second tower are between RM2,000 and RM2,100 psf. According to Veritas’ design brief, the development is designed to “reshape and create a new character in the urban fabric responding to the neighbourhood”. Apart from placing the shops on a “grand walk of fame” along the main road to enhance the public’s experience of the urban landscape, the design incorporates urban courtyards to boost retail activities and create “urban nodes and landmarks” that connect the project’s components. “To encourage tourism and with the support of the government, Star Residences will introduce the Walk of Fame that will stretch over 200m from the intersection of Jalan Ampang and Jalan Yap Kwan Seng to the perimeter of Star Development,” it says. Meanwhile, the serviced apartment blocks are positioned to provide good views of the KLCC and fit into the triangular site. The entire development’s façade has a meteor shower pattern that will be created with textured metal and tinted glass. “The geometry of the towers allows the architecture to playfully respond to the changing hours by creating different shadows patterns throughout the day,” Veritas says. Angsana in Teluk Bahang, Penang, is a beachfront integrated development comprising a 9-storey hotel to be operated by the Banyan Tree Group under its Angsana brand, a 16-storey block of Angsana-branded luxury residences, a 27-storey block and a 5-storey, 90,000 sq ft wellness centre. The project is developed by Senja Aman Sdn Bhd. As the group had already envisioned a wellness project to attract medical tourists, this proposal worked to its favour. “There are so many hotels in Batu Ferringhi, why would anyone come here? And at that time, this was all the rage. People were talking about wellness and treatment. Then, the client brought it up and it worked,” says David. “Every smart developer and architect knows what people are looking for. Fifteen years ago, no one would have talked about this ... people don’t even know what it is. But people want that now — to go on vacation and treat themselves. Designing the branded residences was also an experience as Veritas had to conform to the design created by the Banyan Tree’s interior design company. Veritas also has offices in Vietnam, India and the Middle East. Recently, it secured a job for a five-star resort in Fujairah, one of the seven emirates that make up the United Arab Emirates. It also has a mid-to-high-end housing project in Uttar Pradesh, India, that will be developed by IJM Corp Bhd. David notes that more international clients are seeking the services of Malaysian designers, which is an encouraging trend. Back home, he believes that the need for affordable housing must be addressed, especially with prices putting most homes out of the average Malaysian’s reach. Rising prices have also driven many people — especially the economically disadvantaged group — out of the city centre. This results in an extra cost to commute to work, he says. Therefore, affordable housing for different strata of society should exist within a city, just like in developed countries, he adds. He notes that currently, developers of luxury high-rises in the city centre, which are typically on small parcels of land owing to its scarcity, would usually evict the squatters there. Citing Mumbai’s squatter solution as an example, he says the developers there are required to provide housing for squatters on the site. “So, there will be one glamorous project for the people driving Bentleys. However, there will be a separate project on the same site and there will be people who can hardly afford motorcycles living there. Of course, we will make it as separate as possible. “If you move the economically disadvantaged people to the fringes of the city, where are the maids, drivers and cleaners going to come from? The traffic in Mumbai is horrible. So, it’s a good way to [solve the labour problem],” he adds.